In the final scenes of “The Truman Show” Truman is on his yacht sailing to a new life. Sailing across the ocean evokes that same sense of navigating in a huge circular bowl of water defined by the horizon rather than land. Our crossing turned out to be one of little wind as opposed to the Atlantic trade winds and swells we were expecting. This alone threw out a different set of challenges to all boats on the ARC+, particularly fuel management (we had to motor much more often than any one had planned), meal planning and water preservation. There are moments when all is right with the world and then from nowhere comes a squall or ten which places you right in the midst of a brain shaped front. A switch from sailing with 12 to 18 knots of breeze behind us and the twin headsails performing beautifully to a 90 degree wind shift and 25 to 30 knots of breeze accompanied by rain and an electrical storm to boot is not uncommon and can happen in a heartbeat. The boys scramble to take the sails down and put the appropriate ones up – I now appreciate the true meaning of “all hands on deck”. Huge down pours of rain, particularly at night, can come across and we have been caught several times with hatches open. I spent one entire watch from 2am until 5am blow drying a number of books that were in the wrong place at the wrong time – never let anyone tell you that having a blow dryer on board a boat is a waste of time and space!! Our daily routine fell in to place early on and the start of each day is much like any morning – a cup of tea is first up followed by the normal ablutions. We like to keep the boat ship shape so bed making and disposal of dirty items of clothing into the laundry bag and general clean up around the space is essential if for no other reason that it makes it easier to move around the cabin. While at sea we have our bed set up with lee cloths to restrict the number of times we can roll off the bed in a big sea. Surprisingly it does provide a sense of security – a bit like snuggling in on a cold night! What differs is the addition of several other activities such as throwing over board dead flying fish that have completed a kamakazi landing on deck during the night or, for those on dawn watch, making sure that the line is in the water to haul in a tuna, mahi mahi or other edible marine delicacies. A Nespresso flat white or similar is the 10am feature, preceded by breakfast (normally of cereal, fruit and yoghurt) and followed by the morning sched at 11 for all ARC + yachts fitted with SSB (single side band radio). This way we all know what is happening in the fleet as a whole and is our way of keeping up to date with friends made along the way. At 12pm we have also scheduled a chat with our Round World Oyster Rally group that are completing the ARC+ with us and this covers more specific topics like fuel use, wind direction, a fishing report, menus, problematic fridge behaviour or any other interesting titbits. On one of our scheds we heard that a rally boat had sent out a mayday and was sinking. Thankfully the German family of 4 with 2 children (9 and 11) were rescued by a commercial vessel re-routed from Cape Verdes. Sobering! Lunch prep normally consists of a mix of leftovers from dinner last night in a wrap, toasties, salads, or even hamburgers with the lot. Occasionally we had a live show to watch at lunchtime as well – such as Frank attempting to haul in a massive fish. Afternoons are about resting, reading, playing cards, watching a movie or being on watch and fishing. An exercise regime is not that easy to follow but planking is one activity that works so any spare flat space on the boat is used for a session when possible. Mind you, just making you way around a boat making passage is an exercise in itself! Fishing is another daily activity and the sound of the line being struck gets all the crew very excited and up on deck to see what is for dinner. I caught and landed my first yellow fin tuna and lucky for me it only weighed about 5kgs. 15 minutes later Logan hauled in a 20kg one – a great physical workout. Sashimi followed – 30 minutes from the sea to the table. Michelle was in heaven as one of her bucket list items has been to catch and fillet a tuna at sea – she can tick that one! Our mid Atlantic swim occurred just short of the half way mark; the ocean was calm and the day hot, the water a deep dark blue colour and with the chart showing a depth of 5000 metres, we were expecting it to be cold, but not so! It was balmy and incredibly soft and inviting…I would love to have lolled in there for a long time but thoughts of giant squid and sharks circling beneath me necessitated being in and out in a few minutes. The further west we sailed the warmer the weather so we have had to devise ways of staying cool during the day. Michelle and I set up a hair washing station on the aft deck as Miss T has an on deck shower. 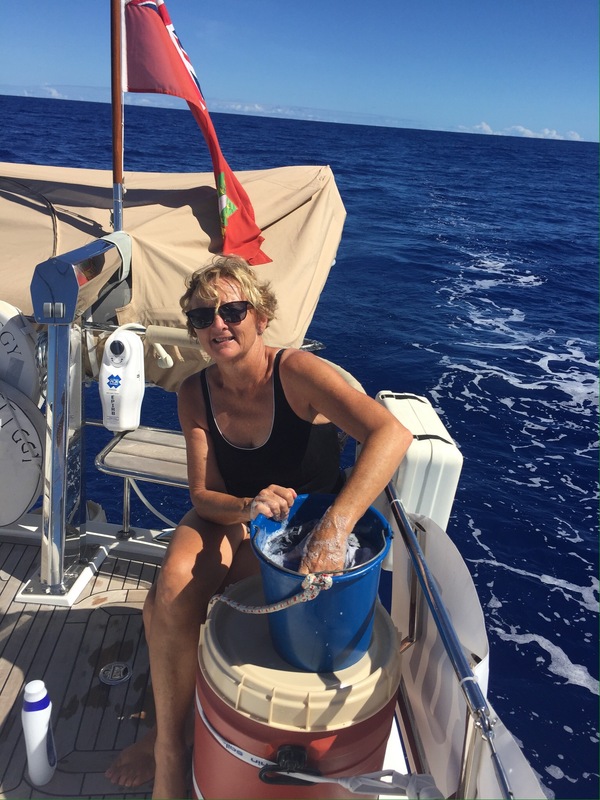 Washing clothes in a bucket was another excuse to use water and get wet at the same time – water is so precious on a boat but the relief of being able to lower the body temperature exquisite!! Communications are essential for weather forecasts, staying in touch with family and any other important commitments. We have a satellite telephone and boat emails for these purposes which are an expensive to operate but totally necessary. As far as news of what is happening in the rest of the world goes, we have had very limited access – wifi will be very welcomed on our arrival. It would be very remiss of me not to say a huge thank you to our fantastic crew, who started this journey with us in Las Palmas in the Canary Islands. Chris Berry our great friend (and furniture designer extraordinaire) from Hampshire in the UK who joined us until the Cape Verdes Islands, Frank Trotman who has been with us since we bought Miss Tiggy and is a fantastic 2IC to James (from the Isle of Wight), Logan Griffiths an ex Topdeck and Tucan driver (originally from NZ and now living in Australia) who assisted Frank and kept our plumbing systems working, resident chef Michelle Elia who catered for us every day with a spread that was worthy of any top restaurant and Michael Roberts DG (domestic goddess with a background in Hospitality) from Melbourne who is going to join us on our quest across the Pacific. A few days out of St Lucia I heard that my loving and loved step-mother Jeannie had lost her hard fought battle with cancer. Jeannie was a tireless worker who has made my father so very happy for over 20 years and who has been an inspiration to many people and causes in her lifetime. Rest in peace dear Jeannie. We arrived safely in St Lucia at 1530 local time on Wednesday 30th November, exactly 14 days after we sailed away from the Cape Verdes. Now for the Carribean and seeing Sal and Will for Christmas! Very excited!! Tiggy, James and all terriffic news that you have arrived in the Caribbean all safe and well. Enjoy the islands, have a super Christmas and new year.